If driving around in a Rugvee (RUGV) doesn’t quite sound manly enough, blame the U.S. Army. But once you get a good look at the tracked vehicle they’re calling “Ripsaw”, you might change your tune—even if you can’t be a passenger. It’s an unmanned vehicle. It’s called the Ripsaw Unmanned Ground Vehicle, and you know how the Army likes using acronyms that translate into odd codenames like Humvee (HMMWV) and Cutvee (CUTV). Regardless, Ripsaw has some teeth. What’s so cool about Ripsaw? 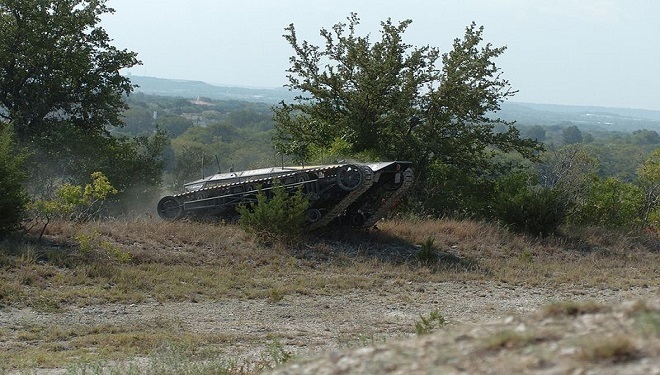 First, the Army’s first unmanned track vehicle is still under development. However, it has been tested. According to one researcher, the vehicle is capable of driving up to 1 kilometer in front of troop formations (1). The Remote Weapons Branch of the Armament Research, Development and Engineering Center (ARDEC) showed off its new creation at Picatinny Arsenal on May 4, 2015, also known as media day. During the test, Ripsaw had an M113 Armored Personnel Carrier as a tail driven by a man in uniform. Another soldier in the M113 controlled the Ripsaw remotely with a wireless controller—both the vehicle’s driving components and its weapons system. The scoop is ARDEC didn’t really create anything new. They took a vehicle already developed and in use and disconnected a copper cable, replacing it with a wireless control system. In Iraq, soldiers grew to love a new weapons system called CROWS, an acronym for Common Remotely Operated Weapons Station. The system allows a soldier to hide in another vehicle (like a Humvee, for instance) and fire the weapons system from a safe armor-protected vehicle. The soldier’s eyes are cameras and range finders. CROWS can also swivel and tilt as necessary. It’s like being the gunner in an M1A1 Abrams tank, completely enclosed in the body of the vehicle, and firing another vehicle’s weapons system, except that some vehicles (like Humvees) don’t offer the soldier the same level of protection as a tank. If you hit a land mine, you can still be killed. The Army developed Ripsaw to solve that problem. CROWS mounted weapons include the M2 .50-caliber machine gun (2), MK 19 40mm automatic grenade machine gun, M240B 7.62mm machine gun, M249 Squad Automatic Weapon, and other small arms weaponry. All of those weapons require a trigger finger in order to fire, so if Ripsaw was going to work, the Army had to figure out how to operate them remotely. The system that came out of their testing was ARAS, Advanced Remote Armament System. ARAS is a self-loading gun that can use several types of ammunition, lethal and non-lethal, switching between them in just a few seconds. So Why Isn’t Ripsaw Fully Autonomous? With all the robotic technology the Army has access to, why didn’t they just make Ripsaw fully autonomous? Why require remote control from a vehicle 1 kilometer away? According to the lead engineer on the project, that’s because the Army still sees war fighting as a human operation. “Robots will never replace soldiers,” according to Bob Testa (1). But that’s not the only reason. Army regulations themselves, as of this date written by humans, prohibit robots from making life and death decisions without a human controlling them. I guess they’re afraid of something going rogue, because humans never do that (3). The Army still has some testing and upper echelon approval to move through before Ripsaw can be authorized for service. But at least we know what to expect from the next ground war. (2) DARPA’s EXACTO Self-Guided Bullet Never Misses – Ever!